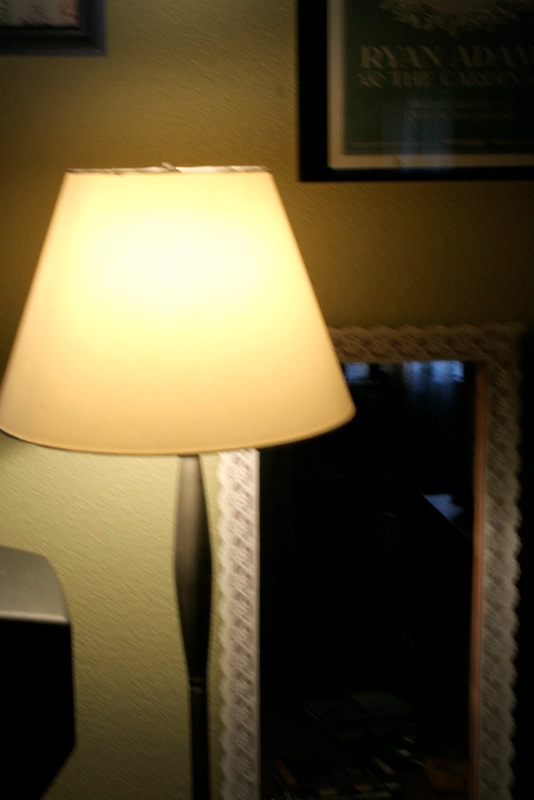 We've had this boring old lamp for ages, and the other night I decided I couldn't bear to look at it anymore. 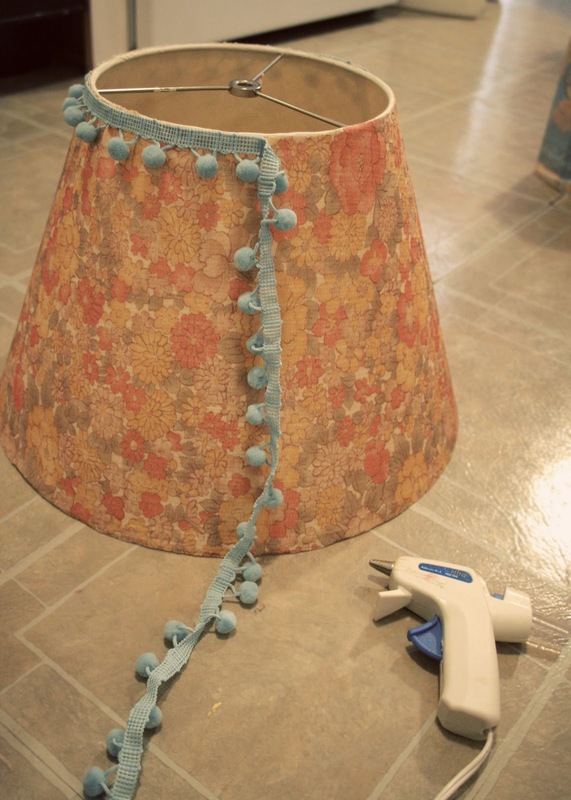 I got out the hot-glue gun (my most favorite tool! 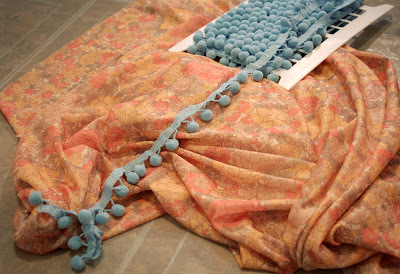 ), some vintage fabric I had stashed, and pom pom trim and went to town! These were my pretty supplies! After I measured out my strip of fabric, I hot glued it all the way around the lampshade, starting at the bottom. Once it was glued, I trimmed off the excess. The fabric I used was a polyester blend, so I didn't have to worry about the fabric fraying. I then added my trim around the top and bottom of the shade. I'm pretty sure I could use this trim on EVERYTHING! All done! Now I have a pretty, pretty shade that makes me proud whenever I look at it! 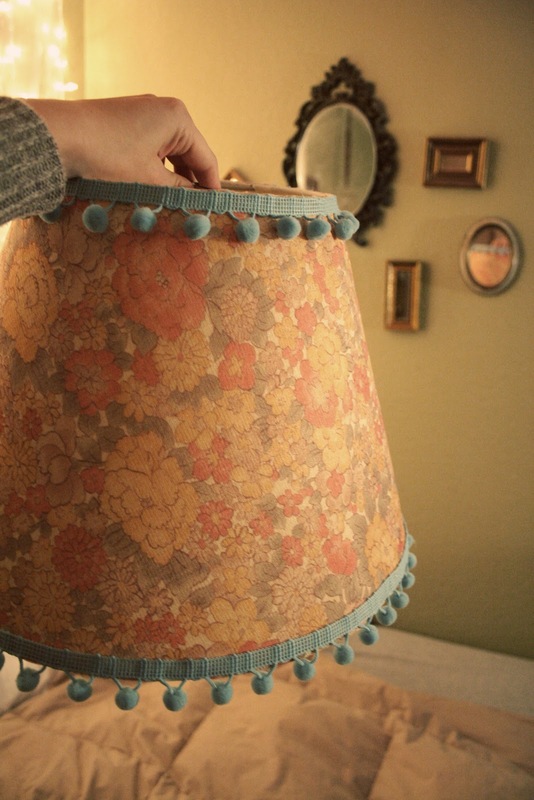 I'd like to note that my fabric was semi-sheer, so it doesn't block out much light when you use the lamp. If any of you try this for yourselves, I'd love it if you left me a link so I can see your finished project! I'm loving this project restyle! its so inspiring!! so cute! i did the same thing a few years back with the dingle berries and such but your is so much cuter! Love it. Think it would get hot enough to melt the glue? LOVE this! What a difference! eek I love love this. 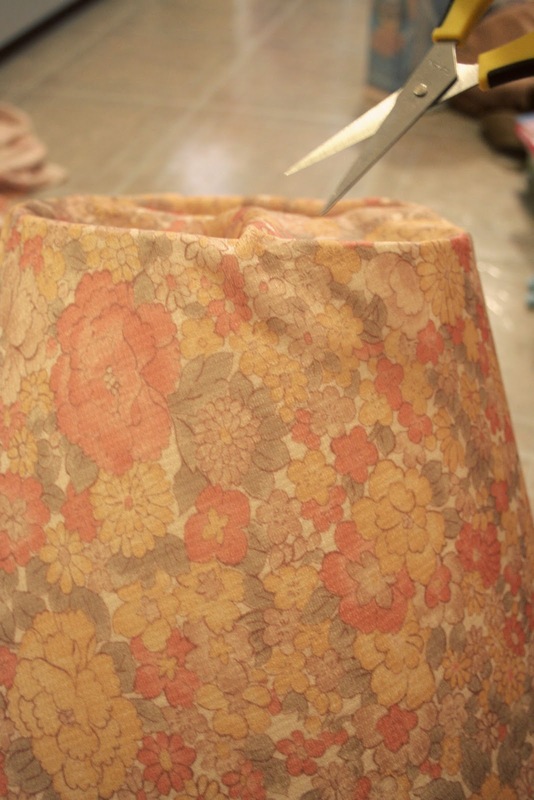 I've had a ugly lamp shade I had no idea what to do with it and almost donated it. So glad I didn't do that. I cant wait to give this a try. that is just too cute! and so easy! i love it! Thanks for getting into the diy tutorials. I am really enjoying these. genius! I want to/will try this! It looks much much lovelier now with it's new flowery coat! 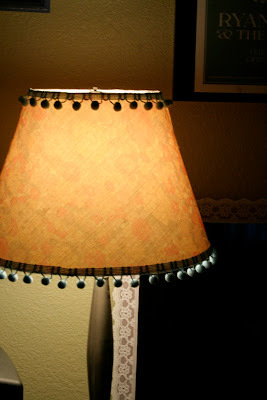 I've once struggled (it was a real struggle ;-)) to do the same with a lampshade, take a look here! such a cute diy :) i love the fabric. I also have a thing for pom pom trim i have a bit of a collection going!! might have to give this ago thanks for sharing. so pretty! I wish I'd use lamps just to customize them like this ;)) the pompoms are the definition of cute. LOVE that trim! I want it on a pillow! that is beautiful!! i'm gonna have to do this. ummm this is waaay cute! Thank you! This was a late-night project the other day...so fun! The other day I wrote a post over on Freshome about the most fabulous lighting collection by Zenza. The lights, which are made from silver-plated copper, have been punctured with thousands of tiny holes that create stunning effects when the light filters through them and casts shadows on the surrounding surfaces.